School starts at 8:30, they do math at that time, they do reading at 9:00, they do music at 9:30, they do P.E. at 10:00, then more math at 10:30, then they have tests at 11:00 then correcting them at 11:30 then Lunch at 12:00 and recess at 12:30, then they do reading at 1:00, then they do small group stations at 1:30 then they do another recess at 2:00 then they have a party at 2:30 and then they clean up after the party at 3:00, what time do they go home today? 3:30 because each activity is 30 minutes so they clean up for 30 minutes then leave at 3:30! 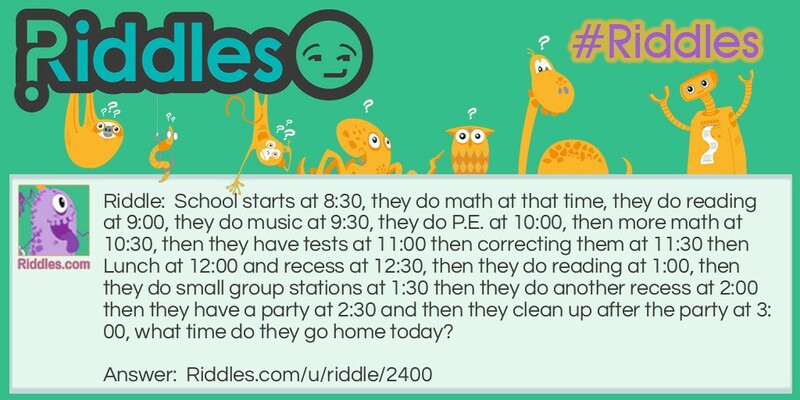 school Riddle Meme with riddle and answer page link.